Walmart Inc. (NYSE:WMT) stock has had a very, very bad year so far in 2018. The shares are down nearly 11.5% while the Dow Jones average is down just 2%. Helping that is a market belief that traditional retailing is dying. 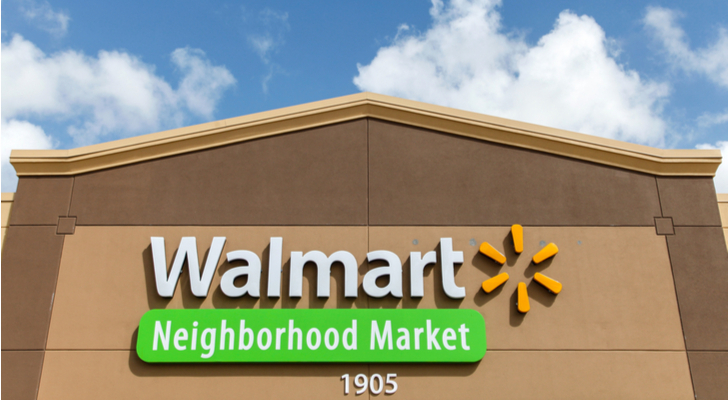 Walmart made another adjustment to this opinion over the weekend by selling its Asda supermarket chain in the UK to rival J Sainsbury plc (OTCMKTS:JSAIY) for $10 billion. The deal gives Walmart $4.1 billion in cash and a 30% voting stake in the resulting company and comes 12 years after the company exited the German market. That money can go right to work, as Walmart is approaching a deal to buy a majority of Flipkart, an Indian e-commerce site, for $12 billion. There are two ways to analyze the deal. One is that Walmart is trading a low-growth market in Europe for a high-growth one in Asia. But that’s belied by another, smaller deal, the sale of 80% of its Brazilian operations to a private equity firm, Advent International. Brazil is not a slow-growth market. The other is that Walmart is trading traditional stores for online sales, as it continues to try and get its hands around the challenge of Amazon.Com Inc. (NASDAQ:AMZN). The recent fall in Walmart has nothing to do with its organic results and everything to do with Amazon. Sales for 2017 were $15 billion higher than in 2016, after years of stagnation. Long-term debt has been cut, and the company had over $28 billion in operating cash flow last year. But Amazon has become Walmart’s Great White Whale — and CEO Doug McMillon has become Walmart’s Ahab. He bought Jet.com for $3 billion to speed e-commerce growth and seemed to be making progress, until this past Christmas, when Amazon’s e-commerce growth outpaced WMT’s. Walmart is also trying to shortstop Amazon’s health ambitions, with a move to buy Humana Inc. (NYSE:HUM). Humana’s market cap is $41 billion, and the shares are up 6% in the last month, since reports of those discussions began. Humana would deliver millions of customers to Walmart’s existing in-store clinics and retail pharmacy, making the stores more of a destination than just a place to buy things. It could also greatly increase Walmart’s online sales. Amazon, meanwhile, would have to start in healthcare from scratch, alongside partners JPMorgan Chase & Co. (NYSE:JPM) and Berkshire-Hathaway Inc. (NYSE:BRK.A), although the three companies do have over 1 million employees between them. Is WMT Stock a Buy? Walmart is due to report earnings for the quarter ending in April on May 17, with analysts expecting $1.12 per share of earnings on sales of $120 billion. That would represent almost 3% year-over-year growth, not bad considering the company’s enormous size, and a nearly 5% increase in earnings. The problem is that more analysts now call Walmart stock a hold than a buy. The recent fall in the stock has brought the price-to-earnings ratio down to 27 and has increased its dividend yield to 2.4%. Walmart is still twice the size of Amazon, even if Amazon could keep its $60 billion Christmas run rate through the year, which it doesn’t. Is it worth a premium to the market, where the average stock sells at a PE ratio of 26? And is that market PE still too high? The main headline here should not be McMillon’s moves against Amazon, or his retreat from retailing. It should be his determination to make Walmart a growth name again. The company’s top line has only grown $24 billion in the last five years — and that’s not good enough. Article printed from InvestorPlace Media, https://investorplace.com/2018/05/walmart-wmt-retreat-retail-continues-asda-sale/.